I was looking at my “smart phone” Friday night. I saw small business in the United States (and beyond?) 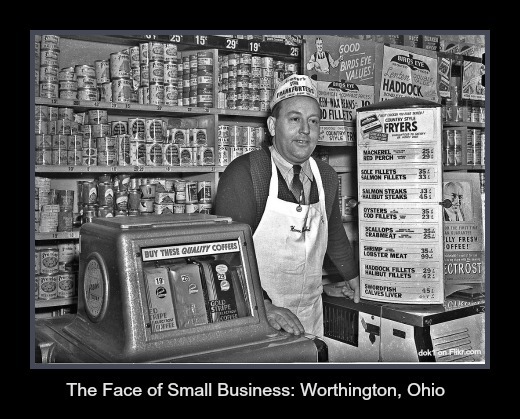 represented by a business on High Street in Worthington, Ohio taken by a high school kid, Don O’Brien back in 1941. Already one heck of a photographer, O’Brien took the photo for the long defunct ‘Worthington News’ newspaper when he was still in high school. … but actually I don’t. I was NOT around in the 1940s. My reaction was more “Hey, I know that photograph!” I knew whose photograph it was immediately. The snip at the top is from Google+ are you on Google+? Google+ looks better on a phone than it does on a computer screen but that’s another story. On a very 21st century post about social media, I saw Mr. Clyde Bachelor’s genial* face in the 1940s representing small business. I recognized Mr. Clyde Bachelor the minute I saw him although I could not place his name. I knew right away the photo was Don O’Brien’s. The 2013 social media post attributes the photo to dok1 which is Don O’Brien on Flickr. I remembered the photo was one of the stores on High Street in Worthington when Don O’Brien was growing up in the Worthington area. Saturday morning the name “Clyde Bachelor” came to me. Or Claude Bachelor? Clyde or Claude… but I was sure the last name was Bachelor. I was able to verify the name on Don O’Brien’s Flickr photostream. The photo of Clyde Bachelor proprietor of the Home Market in Worthington, Ohio c. 1941 is in the Worthington Business Set of Don O’Brien’s Worthington Collection on his Flickr photostream. There were two or three grocery stores or general stores on High Street in the 1940s. I believe from Don O’Brien’s photos there was a Kroger, an A&P and this store, the Home Market on High Street in the 1940s. The building that was the Home Market was Scottie’s most recently. The face of small business? Don O’Brien uses the word “genial” in his Flickr.com description of the Worthington shop keeper in 1941. 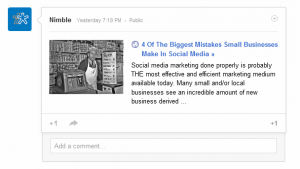 The Google+ article I saw on the small screen (the really small screen, a mobile phone) was a post from a social media guru about why small business owners should not try to use social media on their own to talk to their clients, the general public about that business. Small businesses need a guru? There is no link to that post here sorry. If you want to read about how you need a guru in 2013 I can give you the link. While High Street in Worthington is kind of caught in time, “Genial owner Clyde Bachelor” representing small business in 2013 is kind of a stretch. The photo used here and elsewhere on the Internet (I’ve used Don O’Brien’s photo of Clyde Bachelor proprietor of the Home Market in Worthington, Ohio on my Worthington, Ohio site: Worthington Old And News, linked in the sidebar here.) There is a business school that has used Don O’Brien’s photo of Clyde Bachelor at the Home Market in Worthington, Ohio in 1941 too. I find Mr. O’Brien’s photo in Google images linked to some sort of people directory, linked to the name Clyde Bachelor. Hmmm. A couple of years ago, a Worthington business person I know grabbed the photo and used the photo to represent Worthington on a Facebook business page. He provided no link to Don O’Brien…. no attribution saying whose photo it is. He did not share the photo from Flickr so therefore there was no link to the story of who the small business proprietor in the black and white photo. He shared it as ” hey look what I found.” Perhaps that proves the 2012 social media guru’s point, some people should hire a social media guru? The license on Don O’Brien’s photo on Flickr is a Creative Commons license which allows me to share it here as long as I attribute the photo to him. The license allows me to add the frame and words too. The framed photo is linked to the photo on Flickr. 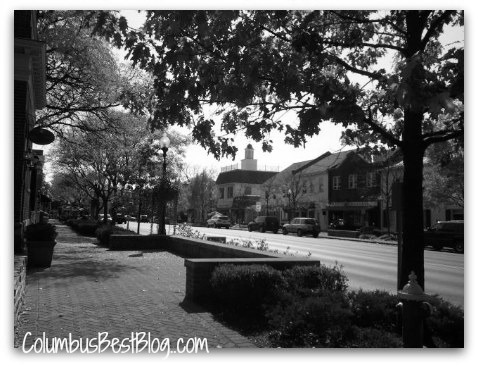 Interested in Worthington, Ohio ? A Flickr visit to look at other Worthington photos from the 1930s to the 1950s can’t hurt. Take a walk down High Street, Worthington in 2013 can still represent small businesses in the USA.